Sometimes updating your kitchen does not have to be super expensive. Painting the room with a new color is perhaps one of the easiest ways to change the atmosphere and make it more vibrant. However, the big question really is which color is right for your purpose? If you’re remaking the overall look of the kitchen, one thing to consider is how you imagine it will look like. Do you prefer the classics? Or do you want it to be more sleek and modern? Maybe you want something like a French pub with a cozy ambiance? Knowing your preference will make choosing the right color a lot easier. The most common colors for the kitchen include gray, blue, white, yellow, red, and green. Red is an intense color and is used in many restaurants because it has been thought of as an appetite stimulant. White, gray, blue, and green are generally more pleasing and calming. Yellow is a cheerful color that brightens and puts life in the room. A mixture of any of these colors creates different shades so if you feel like being creative; looking at the color wheel is a good place to start. With the number of colors to choose from, however, sometimes it is difficult to decide which one to pick. To help you decide, consider the cabinets and other accessories that you already have. For example, white cabinets usually go well with any color. On the other hand, wooden cabinets complement some colors more than others. If you are planning to buy new items like cabinets, tables, kitchen islands, chairs, and so on, it is best to pick up these items first before you decide on a color. The idea is it is easier to change color compared to buying new appliances or furniture pieces that are more expensive. To have harmony, stick with neutral colors if you have colourful items in your kitchen. On the other hand, if your cabinets and other accessories are mostly white, you have more freedom to choose any color on your wall. The same is true for counter-tops except that you have to consider its detail as well. More elaborate detail works best with neutral paint. The idea is to tone down one element if the other is already elaborate to avoid the two from clashing. Some people prefer to use more than one color. You have probably seen playful designs and colors in magazines and websites. This works too, but you have to know which colors go well with each other. Another thing to consider is that cabinetries, appliances, and countertops with classic designs may not go well with a more casual backdrop. You can be playful with more modern items that are either plain white or neutral. 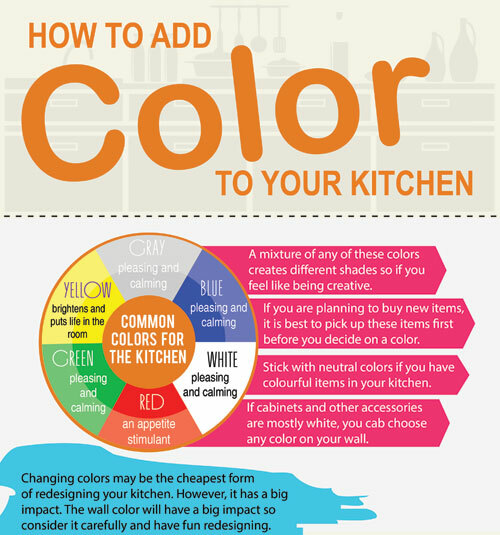 As mentioned earlier, changing colors may be the cheapest form of redesigning your kitchen. However, it has a big impact. The color of the room changes its mood and that is one big consideration to take note of. Think of what you want to feel like the moment you enter the kitchen. Do you want to feel more relaxed or roused? Do you want it to be more vibrant or toned down? You will be spending a lot of time in the kitchen whether you are preparing meals, eating with the family, or entertaining friends. The wall color will have a big impact so consider it carefully and have fun redesigning.